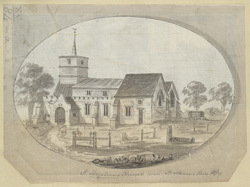 View of St Stephen’s Church in St Albans, Hertfordshire. St Stephen’s dates from the 10th century when it is though that Abbot Ulsinus of St Albans founded three churches in the area- St Michael's, St Peter's and St Stephen's. The churches were built for the use of pilgrims to the shrine of St Alban. The church was enlarged in the 12th century and the Lady Chapel constructed in the 13th century. The church was extensively refurbished in the mid 19th century and the work was carried out by architect Sir George Gilbert Scott. He replaced the short bell cote and ‘Hertfordshire’ spike, seen here in this print, with a large wooden steeple.